Is student loan debt based on borrowers’ college region? 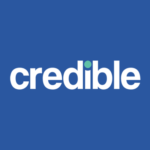 In this edition of Credible Insights, we examine if the region in which a student attends college affects how much they can expect to spend in tuition, room and board, and fees, which can have a direct impact on the amount of student loan debt a student graduates with. To provide these insights, Credible analyzed the recent College Board report Trends In College Pricing. Tuition of both four-year public and private colleges vary greatly based on the region. The cost of attending private colleges more than double four-year public colleges in every region except the Western States. 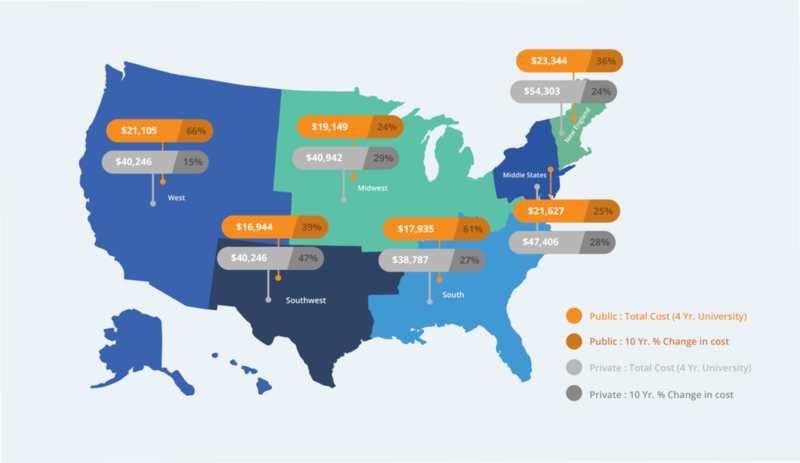 New England and the Middle States have both the most expensive four-year public and private colleges, while the South and Southwest States are the most affordable. Tuition has increased dramatically in the last 10 years, likely in part due to states cutting funding to public universities. *College Board defined the regions as follows: Middle States: Washington, D.C., Delaware, Maryland, New Jersey, New York, Pennsylvania, and Puerto Rico. Midwest: Iowa, Illinois, Indiana, Kansas, Michigan, Minnesota, Missouri, Nebraska, North Dakota, Ohio, South Dakota, Wisconsin, and West Virginia; New England: Connecticut, Massachusetts, Maine, New Hampshire, Rhode Island, and Vermont; South: Alabama, Florida, Georgia, Kentucky, Louisiana, Mississippi, North Carolina, South Carolina, Tennessee and Virginia; Southwest: Arkansas, New Mexico, Oklahoma and Texas; West: Alaska, Arizona, California, Colorado, Hawaii, Idaho, Montana, Nevada, Oregon, Utah, Washington and Wyoming. Many of the country’s most prestigious colleges and universities are in New England, so it’s no surprise to find that the region’s public and private colleges are the most expensive in the country. Though New England is home to many leading institutions that add to its lure, other areas are quickly catching up in cost. Cost increases at public institutions have outstripped those at private schools. While private universities across all regions have seen costs rise by 28 percent during the last decade, public universities saw costs climb by a staggering 42 percent. Mind you, these cost increases are adjusted for inflation over that period of time. Public universities in the West and South saw tuition and fees grow by more than 50 percent during the last 10 years. The underlying reason for the dramatic increase in the cost of public universities is often attributed to cutbacks in state funding implemented during the Great Recession – this may well be the most alarming trend, as public schools have long been seen as the institutions accessible to a broader base of students. Should region be considered when attending college? Anything that can increase your potential debt load as a student borrower should be considered when assessing your options. There are clear trends of the cost of college attendance by region, with the most significant being increased cost of college often far outpacing inflation. But beyond the overarching trends, student loan borrowers should try to focus more acutely on specific schools and degrees. Both of these will determine student loan debt load as well as a borrower’s ability to pay back those loans more so than any region. In our Credible Insights piece Which Type of College Gives Student Loan Borrowers the Biggest Bang for Their Buck?, prestigious colleges in expensive regions leave student with minimal student loan debt compared to their peers, and a good ability to pay it back: Harvard University students graduate with an average of $6,000 in total student loan debt and an early career salary of over $61,000. Wellesley College graduates typically have about $8,000 in student loan debt with an early career salary of $49,000. What Is Bernie Sanders’ endgame for college affordability and student loans?